Lamb,Dried Chicory Root, Natural Vegetable Glycerin, Sea Salt, Mixed Tocopherols. The Real Meat company has started adding tiny bits of pieces to what is supposed to be a treat. I will be looking for a new pure treat because I am unable to use about 1/3 of the bag. I used to purchase this all the time and ran into this issue. Stopped using it and thought I would give it a try again (hoping that it was just a temporary glitch) but no, the bag has what almost looks like sawdust along with the treat to get it up to weight. Sad...this used to be a very good dog treat. My picky little dogs really like these. I have tried several flavors and they love them all. My dogs loved them but I think they were a little small. Great for dogs smaller than a dauchsund. But my dogs loved them so much they tried to inhale them which resulted into choking a little. They survived but if the treat was a little bigger they would of chewed it. All 3 of my furry friends LOVE these. (And one of them is very picky.) 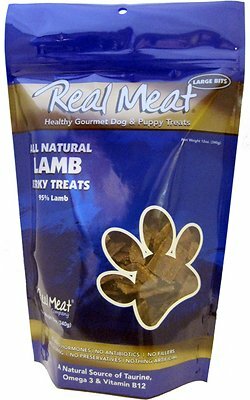 I have to watch out for beef treats, so these are a great alternative and they don't have any scary ingredients. We love these and the price at Chewy can't be beat anywhere around me. My little 12 pound Havanese/Shitzu LOVES these, especially Lamb. I have tried other Real Meat treats which she likes but they tend to be less moist than the Lamb treats. Since she lost a bunch of teeth in her last check, she has fewer teeth for chewing so I don't like giving her treats that are too hard or brittle. I also appreciate that these treats are healthy. Abby and foster seem to like these alot . Abby is the picky one. Foster not so much however he has been know to turn his nose up at a few things. Lol he's kinda like the little boy Mikey give it to foster he will eat anything . the important thing is they do like them and they are very nurishing for my babies. And that's what counts and give me a piece of mind..
My dogs love Real Meat treats! If your dogs are smaller, you can break them up easily. They are perfect for dog sports. 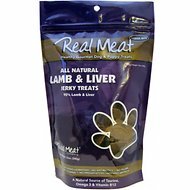 I feed my dog Bumble REAL MEAT treats...and I found this product meets my standards as well as my dog's. My dog loves these and they are great to use for training although they I do cut them down for this. My 14 week old Newfoundland loves this treat. It is great for training because it is soft and breakable into small pieces for rewards. He knows his name and can sit, lay down, come, roll over and best of all he is almost completely house broken.